RTC stands for real time clock folks. 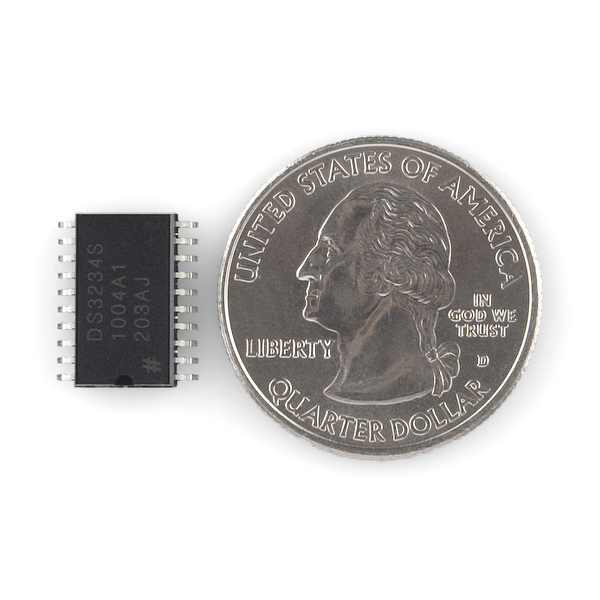 The DS3234 is a low-cost, extremely accurate SPI bus RTC with an integrated temperature compensated crystal oscillator (TCXO) and crystal. If you aren't looking to design your own breakout board, never fear, we have you covered with the DeadOn RTC Breakout! Vaild up to 2099? Is this the beginning of a Y2.1K bug? It's a physical design limitation, And it is valid until 2199, not 2099. Smart software could compensate by maintaining it's own century counter in the RTC's SRAM. However i doubt this device could last more than 200 years in the field. Wikipedia has a nice article on semiconductor failure modes if your interested. No, it's 2099, and it's nothing to do physical, it's a calendar thing. The device adds a leap day on multiples of 4 years, but 2100 is not a leap year. What are the dimensions of this part? I could not find them in the datasheet. The datasheet doesn't include the actual dimension data, but rather includes a link to another document that does have it. It seems that every second increase all records in one unit, if I only read every 5 seconds they increased 5 units. Could it be a wiring or soldering problem or is the DS3234 damaged? I wish I could find an inexpensive WWVB receiver circuit to go along with this to set the time automatically (radio conditions permitting, of course). Sparkfun no longer offers their WRL-10060 RoH kit and the closest thing I found was from Galleon, which sells a receiver circuit (EM2s) @ $40 and an antenna $27 plus $20 s/h. It's cheaper to cannibalize an "atomic" clock. is there an eagle library for this part? It should be in the SFE library. We make a breakout for it, see below. Wow. We've been waiting a LONG time for a board for this chip. It looks like such a great set of features for a good price. I wonder why it seems to have been orphaned by SparkFun? 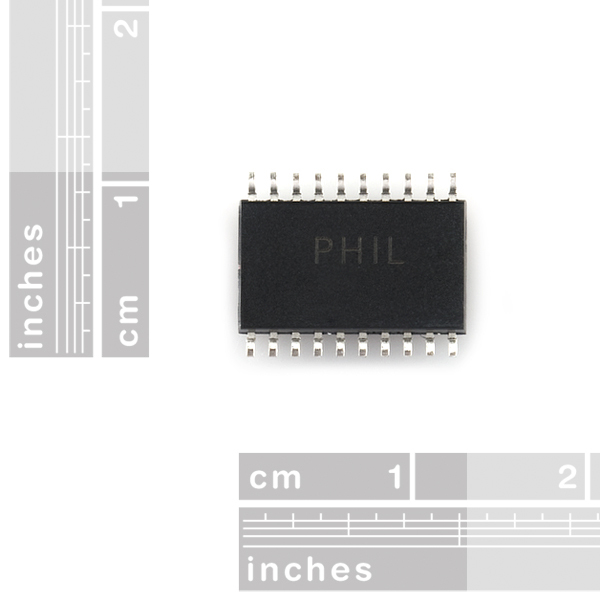 While I wait for SF, it looks like I can get a 20 Pin SOIC adapter for 70 cents from Futurlec. I'll have to kludge the battery, etc. but really need to get on with the project. any due date on the board? Anxiously awaiting the breakout board! A nice addition. 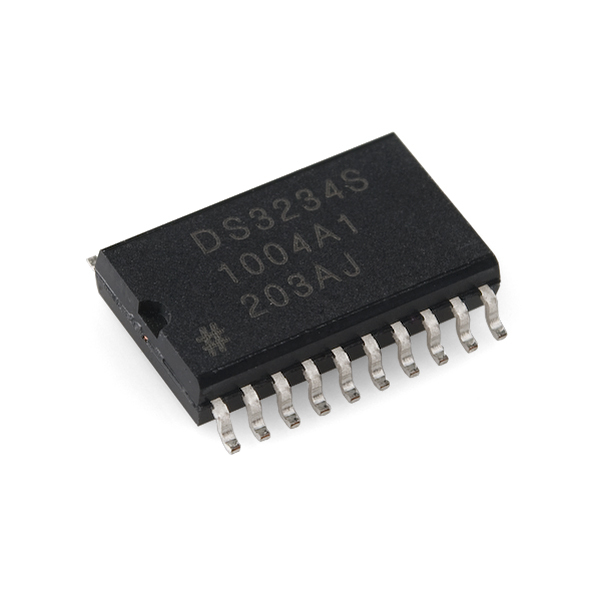 But could we get the DS3231 for I2C?. Why the desire for I2C?. Two wires less? Compatibility with existing I2C chips and peripherals? Also, do you really need duplex comms on a clock? Shouldn't this be under SMD ICs not General ICs? I think i ordered an I2C version from Maxim a while back. It was a DS32B35-33#, It even had the same package. Eagerly awaiting the breakout board. I was looking at this chip just a couple of days before you announced you were carrying it. This would be a good match for your PRT-09216 3.3v step-up board. A nice addition. But could we get the DS3231 for I2C? And possibly update the DS1307 to DS1337? 2100 if I remember right is NOT a leap year, so it probably does a mod4 test. Now if only sparkfun would do I2C. A current mirror "breakout" would solve many bus problems.